The United States economy is struggling under a crippling debt and has recently been downgraded from AAA to AA+ by the economic ratings agency, Standards & Poor (S&P). Whilst the USA is not the only country to be downgraded recently, they are certainly the largest and most influential on world markets. Much attention has been given to the recent dispute over increasing the debt ceiling, which was required for the US government to pay the interest on its debt. The Republicans who control Congress refused to pass the bill by the Democrats, who control the Senate. The Republicans blamed the Democrats for poor fiscal management. However, it is the Republicans who have accumulated the most debt over the last 30 years. The recent request to increase the debt ceiling is nothing new, in fact, the Republicans have increased the debt ceiling more times than the Democrats ever did in order to pay for their massive budget blow-outs. 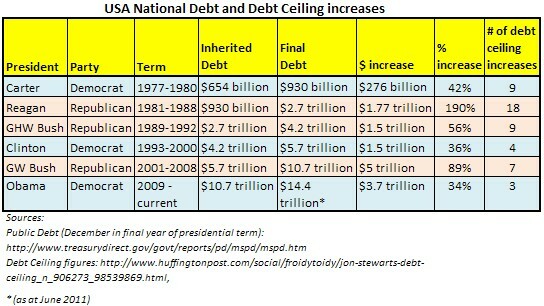 President Ronald Reagan raised the debt ceiling 18 times, whilst President George W. Bush raised it 7 times. During the Global Financial Crisis then President George W. Bush decided to stimulate the economy through tax cuts to the wealthy and a trillion dollar buy-out of banks whilst continuing to spend billions in Iraq and Afghanistan as lower income earners lost their houses, their jobs, their incomes. Under George W. Bush spending on essential government services such as health and education was cut in favour of boosting the Defence budget and funding the "War on Terror" through invading Afghanistan and Iraq. Additionally, he privatised core public services, costing the USA government trillions of dollars as contracts were awarded to companies whose boards included senior politicians such as Rumsfeld and Cheney. Republicans, the Tea Party and those conservatives who believe in small government seem to not understand that government is dedicated to delivering a service. It is the service that is the priority for government, whereas profit is the priority of private industry. It is a fallacy to assume that private industry is always less expensive, more efficient or more capable of delivering government services than the government is. Privatisation, essentially the surrogacy of government service and responsibility, was not done to better society but to pander to the extreme capitalism of multi-national business. All manner of service has been privatised including security and defence, law enforcement, education, health, prisons, road construction, public transport, administration, communication, air traffic control, municipal services and postal services. Often privatisation produces no cost savings to either the government or to the consumer, and rarely does it result in better service. The USA is not any safer, healthier, better educated or more efficient because of the divestment of government responsibility to the private sector. Under the Republican government of George W. Bush, the private sector was rarely held accountable for service delivery or compliance with national and international legislation. The religious right has also encouraged this extreme capitalism and campaigned for downsizing of government, arguing that churches are best placed to care for people in terms of charity, health and education. Of course, these churches will charge either the government or the consumer (or both) for these services so it is in their financial interest for these services to divested to them. The religious organisations interested in providing these services are effectively commercialising and politicising the gospel for money and political power. Very little love or tolerance is preached in their religious messages whilst embracing a "prosperity" teaching which is at odds with the austerity and anti-materialist message of Jesus. The religious right has gained an incredible amount of influence in the USA government. Rather than use this power to hold government accountable for its treatment of its citizens and the lies and excesses of the War on Terror, the religious right encouraged anti-muslim sentiment to justify the War and demanded privatisation of government services; contributing to the massive debt increases under the Republicans. The Republicans have shown themselves to be more interested in boosting big business than in caring and providing for their own citizens, other nations they involve themselves in, or in improving conditions for workers, the poor, the disadvantaged. Even small business operators struggled in this extreme capitalism as globalisation saw the influence and power of big business undercut, undermine and take over or wipe out many small businesses, costing livelihoods and jobs. The USA government, particularly under Republicans, has been funding and encouraging the greed of unfettered capitalism at the expense of its citizens, making the rich richer and the poor poorer. This greed has resulted in massive increases in the USA national debt, company debt and personal debt as companies and people chase the dream of a capitalist utopia, ostensibly through the myth of wealth creation using "other people's money". The USA government needs to get back to basics in order to address the poverty, health and education issues facing its society and to reduce its public debt. Government should be concerned with governing. This includes delivering essential, core services required for the improvement of society through an efficient and dedicated public service not through an unfettered and unaccountable market-place. Government should not be abdicating its social, political and fiscal responsibilities to private industry or to religious organisations. The massive United States national debt is the product of this abdication. For the sake of the United States and world economies, the US Government needs to be returned to the people for the benefit of the people, not to big business for the benefit of big business.